Anyone that has a blog knows there are times that it is very difficult to come up with things to write about. Sometimes you just don’t have time to write, but need to create a post quickly. I am going to tell you how I use the free, non-business version of Evernote to keep blog posts flowing and the blogs I write for active. As you are reading this, keep in mind that you can use the items you save in Evernote for research and ideas for upcoming articles. But you can also use the items you save directly in articles. I am going to explain how you can do this. Evernote is a free tool that allows you to save basically anything that you are interested in. You can save URLs for images, articles, videos, images, infographics and anything else that has a URL. 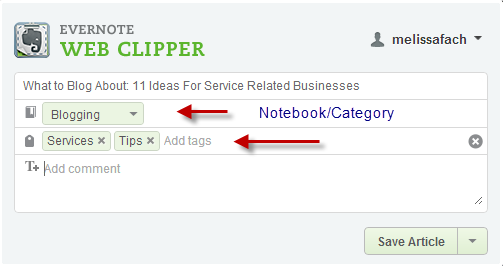 Evernote essentially “clips” an excerpt of information from a web page and the items you clip are organized. You can login to Evernote from any computer. There are extensions for the browsers you use and there are apps for mobile devices. Basically, you can get to your saved information from anywhere. In Evernote you can create “notebooks” (basically categories) and you can tag whatever you save/clip with keywords so you can search your notebooks easily later. By saving good articles, you always have a way to find great information when writing new articles. You also avoid that, “Where did I read that?” problem. It is important to “tag” articles in any way that can help you sift through articles or web pages later. Once you have 50 articles on blogging, for example, it might be easier if you could just find the articles related to “services” only. I also suggest tagging with the year of the article so you can determine if information is old or new. Sometimes recaps can be a great way to share information. Recaps can be on any topic and they are often a collection of educational information for the reader. Let’s say you work in Excel all the time and you research ways to create things, like pivot tables. Perhaps you want to create a collection of “how to” articles for your readers. If you have saved the educational articles you have read in Evernote you can just go in and search for “Excel” and see a list of articles that might be good for your readers. It is easy to create a recap post this way. As you read, you can save articles you think are great for recap posts. You can even tag them with something like “recap Google analytics.” When the time comes you can have all the articles you need in one place. I personally “clip” anything I find that is useful to me or could be for my clients or my readers. When I need a recap post, I have tons of articles to choose from. When you find something great, remember the possibility of recaps and tag accordingly. There are many items out there that you can use in your blog posts to supplement the information you already provide. To be totally honest, there are times that I have nothing to write about or I just don’t have time to write a long blog post. So I dig into things I have saved in Evernote to help me out. I have categories for infographics, videos and Slideshares. Most of the time, items like these just need an intro paragraph or two and I have a blog post. Evernote can be an amazing backup tool for writers that have no time or have writer’s block. Subjects / Topics: All of them. Sometimes a media item covers more than one subject, so I list them all in tags. Blogging is not easy and keeping a blog active is not easy. 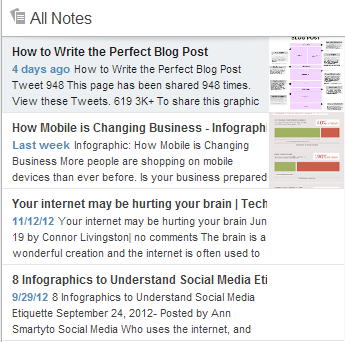 If you are responsible for keeping a blog going, I suggest you take advantage of the free version of Evernote. Create a library of information that you think is important and could be helpful to you. Find a way to collect items that will help you with blogging. Whether it be ideas or items to use. You can’t remember everything so let Evernote remember for you. I use it daily and it has helped me with blog posts more than I could ever explain. I hope it can help you too. Also check out the features of the business version of Evernote.